Zebronics has launched its 5.1 Shark Tower speakers in India. Designed to deliver a high-fidelity audio experience, the speakers are priced at Rs 21,211 and are available across all retail stores in the country. The speakers come with a 3-way acoustic design and have a 3.8cm tweeter paired with mid-range 7.6cm drivers. A 20.3cm front-facing woofer promises to deliver dynamic sound quality. Taking advantage of the large-capacity cabinet design, the speakers claim to produce thrilling bass tones. The wooden enclosure system is further suppresses cabinet resonance. The speakers have 180watt RMS output and users can stream music to the Shark Tower speakers through Bluetooth. It’s also possible to create virtual 5.1 surround for any 2 channel input. 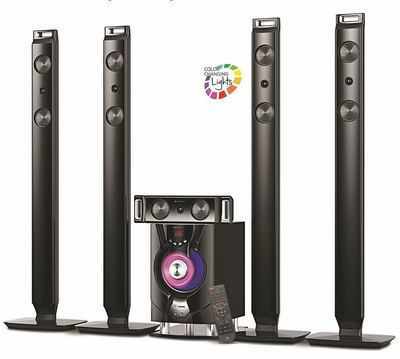 The speakers can be easily connected to PCs , TVs, MP3 players and DVD players. There’s also a USB port and an SD/MMC card slot, along with a remote control. Last month, Zebronics launched a new gaming chassis designed for high-performance systems. Dubbed Premier, the chassis is priced at Rs 4,040 and is claimed to have extensive cooling advantages and expandability. Zebronics Premier gaming cabinet provides flexibility and numerous storage options. Users can install up to three 3.5-inch hard disks, two 5.25-inch optical disk drives and two 2.5-inch solid-state drives. It also has a total of seven expansion slots. With a tool-free drive bay design, Premier has two USB 2.0 ports and one USB 3.0 port, along with a microSD Card reader. The chassis has a transparent window on the side panel and the front, along with stylish chrome rail. The enclosure consists of dual 120mm front and rear fans for optimized cooling.